Did you know that your due diligence mindset is your X-factor for retiring rich and happy? In this case, ignorance is not bliss. Is this the same due diligence that sellers view as painful, time-consuming, and expensive? Let’s save the theory for the classroom. Read and prosper from my in-the-trenches experience of my 9-figure exit. You’ve worked hard and have sacrificed too much to drop the ball at the last moment. Yet, this is exactly what most entrepreneurs do when selling their business. Buyers laugh all the way to the bank with the money you left on the table from the wrong due diligence mindset. To put it another way, I’ll ask you a question. Imagine that your single. And if you’re married, go back to the time you weren’t married. If you’re walking down the street would you say ‘yes’ to an attractive stranger asking you to get married? If you’re like most people, you’d want to date before getting married. Dating lets you know if there’s chemistry with the other person and a fit. It’s the same for your future buyer. Buyers will not pay top dollar for a company they know nothing about. But what due diligence mindset do you need to retire rich and happy? The right due diligence mindset has you know that the process exists to protect you as much as the buyer. Due diligence identifies and converts the unknown into calculated risks. The buyer evaluates you, your team, the market, your product, and technology. Expect detailed background checks on you and your team. The buyer scrutinizes your sales, marketing, and projections. The buyer wants to know how much of the marketplace you’ve captured, and as important, what you haven’t. For the buyer, the market size and opportunity are key. The buyer calculates the funding needed and how to get a return-on-investment. Now that you know, your due diligence mindset is putting the buyer at ease. Do any of your agreements, or lack thereof, concern you? If ‘yes,’ fix this now and don’t wait for later. And while you’re at it, size up the potential buyer and perform your own background checks. How will the buyer finance your deal? Does your buyer have the ability to finance your deal!? A common tactic amongst buyers is to come in with a high valuation on the letter of intent. The value is later lowered after diligence. My due diligence mindset had me prepared. Through my investment banker, I made it clear that this bait-and-switch ploy was a no go. As a result, the valuation remained unchanged. The right due diligence mindset made the difference. When it comes to your due diligence mindset, a positive mental attitude is everything. A positive mental attitude is your gateway to success in business and life. I was that kid right out of school who started a business with no money, team, or experience. What took me from zero to a 9-figure exit was a positive mental attitude. You can read my story and the stories of other successful entrepreneurs here. Whether you ‘love’ or ‘hate’ due diligence, it’s not going anywhere and will always be part of the process. Looking to retire rich and successful after your exit? Develop a due diligence mindset that has a positive mental attitude. A positive mental attitude has you view due diligence as an opportunity. Due diligence is an opportunity to educate your future buyer about you and your company. You do this when you’re on the hunt for a new customer. The truth is, your future buyer will be your biggest customer. Ever. A due diligence mindset with a positive mental attitude has you thinking like a coach. As a coach, you’ll help your future buyer master the understanding of your company. Both you and your team are patient, quick to respond, and committed to the process. When you and your team act like a coach, you receive two benefits. Be quick to respond and handle yourself under stress. You’ll earn the respect of your future buyer. As important, the more comfortable your buyer is the higher your valuation. A due diligence mindset with a positive mental attitude has you prosper and win. With the right due diligence mindset, you give people what they want so you can get what you want. Do you know the name of the world’s most popular radio station? It’s called “WII FM” and it stands for What’s In It For Me. To unlock your sweet success, tune your due diligence mindset into WIIFM. Find out who is in charge of due diligence and meet up with this person. Now that you know the schedule, work style, and process you can make the lead diligence person shine. Like you, your future buyer wants diligence finished on time and budget. To help get the job done, set up weekly calls with the lead diligence person. During your calls, you’re keeping the communication channel open. Remember, you’re here to serve the lead diligence person, not the other way around. By giving the lead diligence person what’s wanted, you’ll get what you want. The right due diligence mindset has you talk to give correct answers, and not talk for the sake of talking. My dear reader, know this and know this well. Your future buyer is smart, sophisticated, and experienced. Both you and your future buyer are in business to be in business. And this is why your future buyer is counting on you to make mistakes. The more mistakes you make, the lower the value of your company. Your future buyer will set fox traps in the due diligence process to see how you do under pressure. You and your team should answer every question asked of you. Professionally answer the question, and when done, stop. You answer the question and say no more with the right due diligence mindset. Know that anything and everything you say can and will be used against you. With a due diligence mindset to win you know that what you don’t say is as important as what you do say. Before answering a question, make sure you understand it. Saying don’t know the answer and that you’ll follow-up with the answer takes courage. Making things up and saying lots of words that mean nothing has you look like a fool and lowers your valuation. Grin and bear it through that awkward silence. Do the unexpected and admit you don’t know what you don’t know. You’ll both earn the respect of the buyer and save yourself many headaches. A winning due diligence mindset has you not putting off until tomorrow what you can do today. Don’t think for a second that your future buyer isn’t evaluating how fast you respond to questions. A quick and accurate response to a question shows that you care and that you and your team are up for the task. A quick turnaround builds momentum for both your team and the buyer’s diligence team. When assembling your exit team, keep this point in mind. Part of your exit team is a virtual data room. A virtual data room is one of the best investments you can make to ensure you are quick in your response and to time. Rapid answers demonstrate that you and your team know that done is better than perfect. When due diligence pokes a hole in your company, turn this around and make it a project to fix it. Better yet, fix it together with your future buyer. Your future buyer will see that you check your ego at the door so you can get the job done. This one action alone speaks volumes about your company culture. When your future buyer feels ownership in the solution, you’ll have a higher valuation. A winning due diligence mindset has you do the unexpected and win. You’ve created a market disruption in your business and won, big time. Now it’s time for you to create a disruption in the diligence process to win. Don’t fall victim to the mindset that due diligence is you being passive and going along with the process. 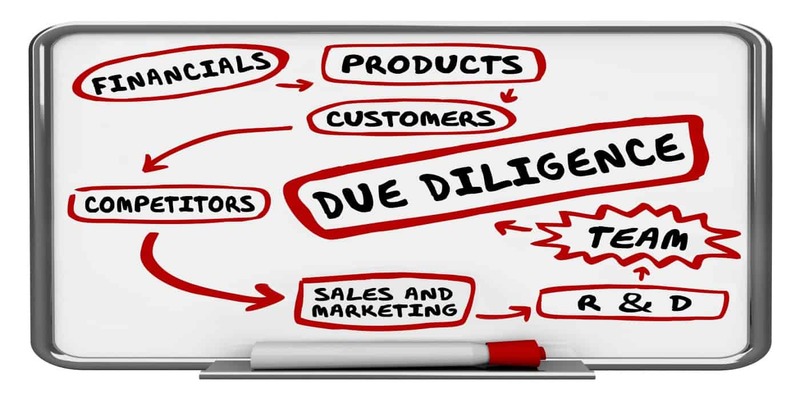 Due Diligence Mindset Tip 3 has you supporting the lead diligence person from the buyer. Do the unexpected and offer to review the diligence draft before it comes official. If you tune into WIIFM, your rationale for offering this is a simple one. You can make the lead diligence person look great by finding and fixing factual errors. Nobody likes to make mistakes, particularly when it comes to due diligence. Offering to review the diligence draft is bold and proactive, and also shows you care. You’ve taken steps to prepare your company before selling it. Build from this and help the lead diligence person ensure the report is accurate. Will you receive a ‘yes’ to your request? I give you a 50/50 on this one. That said, nothing ventured, nothing gain. And you everything to gain. Have a winning due diligence mindset and do the unexpected and win. Do you want to win, and win big? Have a due diligence mindset of knowing what you want. If you’re like most entrepreneurs, selling your company is your first rodeo. It’s a different story for your future buyer who has been around the block many, many times. Your future buyer will be asking for things that are not to your benefit. A winning due diligence mindset has you knowing what you want. And as important, knowing what you don’t want. There are at least five issues you better figure out before even think about selling. Your buyer will want you to take on as much liability as possible, for obvious reasons. This is also why your future buyer will ask for an earn-out and large escrow and refuse a non-reliance clause. My advice is to avoid an earn-out, no matter what. Once you exit your company, you have no control over how it’s run. You’ll likely never see your earn-out. You should also assume you won’t see your escrow. Buyers can be calculating and conniving. While you can’t avoid an escrow, negotiate hard for the smallest one possible. With a winning due diligence mindset, you know in advance what is and is not acceptable. Figure out what you want, and don’t want well in advance so you can win big and retire rich and happy. If you want to retire rich and happy when selling your business, you need a winning due diligence mindset. You’ve worked too hard and long to drop the ball at the last moment. Sadly, this is what most entrepreneurs do when selling their business. What is the right due diligence mindset and how do you get there? Let’s leave the theory for the classroom. In this article, I’ve shared 7 due diligence mindset tips that helped me achieve a 9-figure exit. The due diligence mindset you need to win is within each of the 7 tips I’ve shared. Start with the first tip and master it before moving on to the next. Leverage my in-the-trenches experience for your benefit, future, and sale of your company. So what are you waiting for, my dear reader? Here’s to you and your success.